Potato (85%), Batter (Wheat Flour, Wheat Starch, Sea Salt (<0.5%), Raising Agents (450, 500), Rosemary (<0.5%), Wheat Gluten, Spice), Canola Oil. Preheat oven and oven tray to 220°C fan forced for 10 minutes. 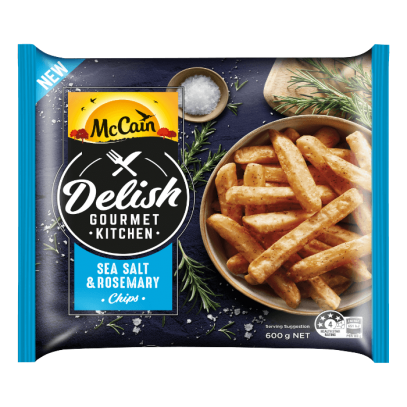 Spread McCain Delish Chips in a single layer, on the middle shelf. Bake in oven for 10 minutes, turn and cook for a further 10 – 12 minutes until crisp and golden. Canola oil is made by crushing the seeds of the canola plant and is considered quite popular due to its healthy reputation. It is low in saturated fat and contains a beneficial omega-3 fatty acid and is much better than other fatty oils that can cause cardiovascular problems if eaten in excess.